Do we agree that trees are a good thing? Maybe, but there are good trees and bad trees, and there are trees that could be good but were allowed to go bad. Just check out your own fencerows, or those along any highway, and you’ll see more bad trees than good trees. It’s up to you to take control and cull the bad, while encouraging and properly training the good. Next to this column are two photos of the same young Sycamore tree. This tree volunteered (came up from seed all by itself) in one of our fields, and since I’m partial to sycamores I steered the tractor around it for a couple of years when I mowed. 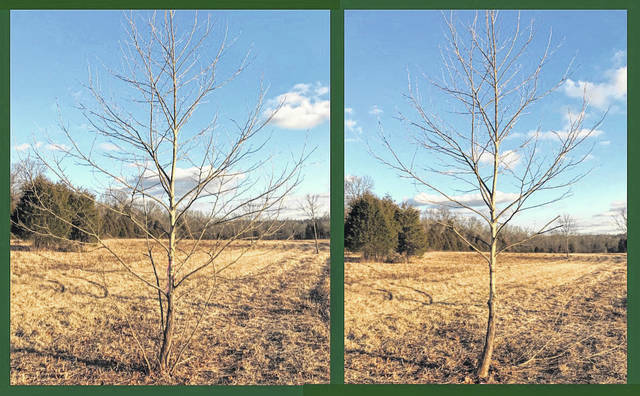 I’ve found that if I do too much pruning on young volunteer trees I’m just inviting buck rubs, so I leave sapling trees alone until they get big enough to survive deer damage. In typical fashion, this tree developed multiple suckers at the base of the tree. The first step is cutting them all off; selecting the strongest and straightest one and eliminating all the rest. If you cut them off “clean”, leaving no stub, new bark will quickly cover and seal the open wounds. Next step is to “limb up” the tree, starting at the bottom. My definition of a shade tree is one you can walk under or mow under, without hitting your head. Since it’s bad to cut off more than one-third of a tree’s branches at any one time, it takes a few years to limb -up above head height. My rule of thumb is that any limb below 7 feet should not be allowed to grow more than an inch thick, so if I have to leave some limbs for next year I leave the smaller ones and cut off the larger ones. You’ll see in the second photo that I cut the tips off the lowest set of limbs that I left for next year. This will cause the tree to do its growing higher up in the tree. Next year I’ll come back and take these particular branches off, and maybe a few more. Bit by bit I’m training the tree to have a nice, balanced “crown” starting at 7 feet or higher. I would never cut a limb off that way, leaving a stub, if the limb were permanent. Now that your young volunteer has four feet of bare trunk, protect it from buck rubs with some wire fencing. Just cut about 18 inches off a roll of wire fencing and set it around the tree, bending the cut-off wires around like little hooks to hold it in place. It should be loose enough so that it doesn’t constrict the trunk or get embedded in the bark. Once the tree trunk is 4 or 5 inches thick, go back and remove it. That’s all it takes to discourage deer damage. Have you ever raised green beans? If so, you know about “culling” every other plant that sprouts from seed, so that the remaining plants have more space and less competition. The same tactic is essential for volunteer trees. Learn to spot and encourage the good ones and heartlessly get rid of the rest. It’s an investment in your property, well worth your time and effort. Time passes awfully fast, and before you know it you’ll have shapely, thriving, long-lived trees all around you. Enjoy! 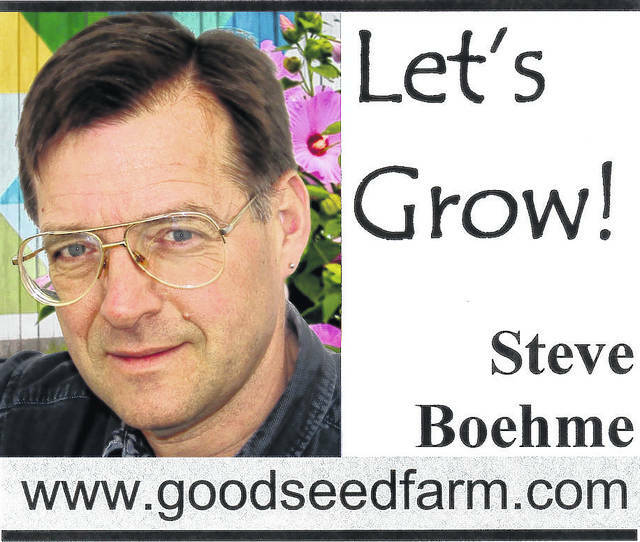 Steve Boehme is a landscape designer/installer specializing in landscape “makeovers”.